The 1989 Stanley Cup playoffs, the championship of the National Hockey League (NHL) began on April 5, after the conclusion of the 1988–89 NHL season. This was the final year that all of the Division Semifinals began with teams playing the first four games in a span of five days. The playoffs concluded on May 25 with the champion Calgary Flames defeating the Montreal Canadiens 4–2 to win the Stanley Cup Final series four games to two. 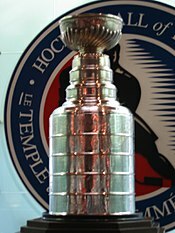 The 1989 Stanley Cup playoffs featured two Canadian hockey teams, the Montreal Canadiens and the Calgary Flames in the finals. Montreal finished the regular season with 115 points, only two behind the league leader Calgary. They had last faced each other in 1986, with Montreal winning in five games. Calgary was only the second opposing team in NHL history to win a Stanley Cup at the Montreal Forum (the New York Rangers defeated the Montreal Maroons in 1928) and the first and only to do so against the Canadiens. Flames defenceman Al MacInnis won the Conn Smythe Trophy as playoff MVP, while Lanny McDonald, who ended the regular season with exactly 500 goals, got his name on the Cup in his last ever NHL game. Flames co-owner Sonia Scurfield became the first Canadian woman to have her name inscribed on the Stanley Cup. Wayne Gretzky and the Los Angeles Kings met the defending champion Oilers in the first round. Gretzky and the Kings defeated the defending Stanley Cup champions after falling behind 3 games to 1. In the second round the Kings were swept by the eventual champion Calgary Flames in four games. Philadelphia Flyers goaltender Ron Hextall became the first netminder to shoot and score a goal in the playoffs, a shorthanded, empty-net score in Game 5 of the Patrick Division Semifinal against the Washington Capitals. One round later Mario Lemieux equaled four NHL-records (most goals in a game, most goals in a period, most points in a game and most points in a period) by scoring five goals and eight points in a 10–7 Pittsburgh win in game five of the Patrick Division Finals. Hextall then made headlines in the Wales Conference Finals, attacking Montreal's Chris Chelios in the late stages of game six as retribution for Chelios' unpenalized hit on Flyers forward Brian Propp in game one. Hextall received a 12-game suspension at the start of the 1989–90 NHL season for his actions. Former Flyers head coach Mike Keenan led Chicago to the Campbell Conference finals in his first year behind the bench. The Blackhawks had the fewest points of any playoff team this season yet they upset first place Detroit and then St. Louis before bowing to Calgary. Calgary defeated Vancouver in seven games. This was the first of three consecutive series between these two teams that ended in overtime of game seven (with the winner of all three series making it to the Stanley Cup Finals). The seventh game went into overtime with both teams having great chances to win the game. The best of these chances was a breakaway for Canucks' captain Stan Smyl who was stopped by Calgary goaltender Mike Vernon. Joel Otto scored the series winner at 19:21 of the first overtime after Jim Peplinski banked it in off Otto's skate to send the Flames into the Smythe Division Final. In game five, Mario Lemieux, listed as questionable before the game due to his neck, tied four NHL playoff records for goals in one period (4), goals in a game (5), points in a game (8) and points in a period (4). This was the second playoff series between these two teams, with the only previous meeting being the 1986 Stanley Cup Finals where Montreal defeated Calgary in five games. This was the Flames second appearance in the Finals, while Montreal was making their thirty-third appearance in the Finals. Calgary was trying to win their first Stanley Cup in franchise history, while Montreal last won the Stanley Cup in 1986. The Stanley Cup Finals was decided between the two teams with the best records of the 1988–89 NHL regular season. Co-captain Lanny McDonald scored the second Flames goal in game six. This turned out to be the last goal in his Hockey Hall of Fame career, as he retired during the following off-season. Doug Gilmour scored two goals in the third period, including the eventual game and Cup winner to cement their first title for the Flames. To date this remains the last all-Canadian Cup Finals. ^ "Vancouver Canucks vs. Calgary Flames: Renewing a Stanley Cup playoff rivalry". April 15, 2015. Retrieved March 20, 2016. ^ "Lemieux ties three records; Penguins win 10-7." Gainesville Sun. 1989 Apr 26.